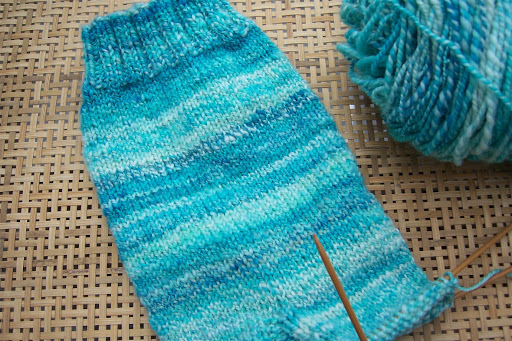 Knitting this sock is like sitting by the Caribbean (or so I imagine). It’s warm and bright and oh-so-blue. Crown Mountain Farms Sock Hop yarn is extra-extraordinary. The day may be damp, dreary and chilly, but who cares when I have this to work on? I’ve been doing lots of not knitting this week. I accomplished the next phase of my life reorganization. I didn’t start out thinking of it this way, but it’s become a real overhaul. After moving, shifting, shoving, and tossing for most of yesterday, I now have more open, uncluttered space in this little home than I’ve had for the seven years I’ve lived here. It feels wonderful. There are still piles and boxes and baskets all over the place, but now I can take my time and go through each one. They’re just the little parts of the big picture. When I walked into my apartment this afternoon it felt peaceful. Not busy, not overwhelming. Restful. I spend every day in very busy surroundings. It’s not just active and loud; the bookstore is also visually busy. There’s nothing to rest your eyes on, because all those books and lights and things are practically vibrating. It’s energizing, for the most part, but I’d begun to crave something at home that I wasn’t getting. It’s coming now. I’m making it happen. Slowly, perhaps. But slow and steady wins the race! Gorgeous blues – tropic oceans. Ah…. I love how you’re describing the changes you’re making at home. I think I need to make those same changes. That sock is such a beautiful color. Bright, yet restful too. I love the colors! Every time I make some progress in cleaning out and reorganizing this house I feel a sense of accomplishment, and it definitely improves my mood. I am loving the sock!!! And I’m so jealous of everything you have been doing at home — I am in a huge funk and just can’t seem to get moving on anything… blah! I haven’t even gotten my tax stuff together to take to the accountant who is going to skin me alive I am sure. There must be something in the air because I’ve been doing the same thing at home. I started with my living room and then my kitchen. For the 1st time in YEARS, my coffee table has been cleared off and uncluttered for about 2 weeks now. One of the girls set a game down on it the other day and I about freaked out “get that game off the table … you don’t put things on the coffee table”. Sigh. I have this desire to dive right into your sock. I love the colors. Congrats on your reorganization progress. You’re inspiring me to keep at it with my attempts to reorganize. I’m envious of that gorgeous Sock Hop yarn, (yes, it really does look like the Caribbean), and also envious of your motivation to declutter and simplify, which I so desperately need to do. I just need to find my motivation, somehow, because right now, I don’t have it. Kudos to you. What’s the rush? You’re making it happen, that’s what matters and YES I understand exactly what you mean by visual buzz and how nice it is to have clear surfaces to gaze at peacefully.Keeping my room relatively clean is part of my Plan to Stay Sane.I salute you! I love those blues! I long for a peaceful, uncluttered home. I can almost visualize it in my mind. But even when I clean my home, there’s all this “stuff”. And it can’t be all that important, I know there are things I haven’t looked at in years. If it were only me there, I know it would be easier, but I try to throw away and then the “others” come in and I lose my motivation.When I left on vacation, I was shocked at how bad the house looked as I left. Granted we had been rushing and packing and being focused on leaving, but it truly was horrible. And how can my kids feel relaxed and good about it either? When we return home, I’m tossing it all out. Except for my yarn and fiber…. Good for you for clearing your space (that phrase probably has meaning on more than one level). I found that even though my knitting room was filled with all the things I loved, it was still too much sensory overload for me to take in. I decided to box up and store out of sight some of my things, to be recycled back in at a later time. I used to do this with my daughters’ toys so they would not tire of them. When the shelved toys were re-introduced later, they were seen as new and enjoyed all over again. I think spring is the perfect time for your project. I’ve rambled enough, but I just wanted to say how inspiring I find your blog. the sock colors are so lovely!